Solid-wood design features soft curves and a rich, warm finish. Graduated vane heights allow clear visibility and easy retrieval. Ideal for sorting messages, mail and bills. Note: A minimum quantity of 56 must be ordered, and in units of 4 thereafter. 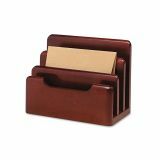 Rolodex Wood Tones Desktop Sorter, Three Sections, Wood, Mahogany - Mini sorter combines soft curves and the natural aesthetics of real wood. Contemporary, sleek look will add an elegant touch to any desktop. Includes nonskid feet to protect furniture finishes. 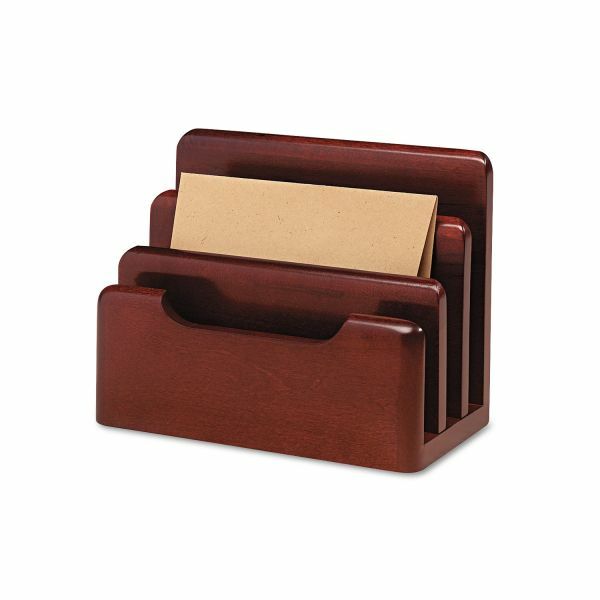 Compact three-compartment organizer sorts messages, mail and stationery. Solid wood construction and contemporary Euro design.